Table based games are often criticized for lacking versatility, as they often have to stay in a single location, where other games can be played anywhere you bring a ball. While it is true that it can be a challenge to move around a game table, there are plenty of models designed to be portable or used in different environments. As you may have guessed, our favorite table game is foosball (but air hockey is a close runner up! ), and one of the best parts of the game is that there are so many different tables. You can find compact portable tables that are meant to be used while camping or at a friend’s house, or you have full-size pro tables. Recently, hybrid tables have also appeared on the market, which are designed to be used either outdoors or indoors, allowing you to have a lot more fun playing foosball. The Garlando G-500 is one of these tables, and we’ll be taking an in-depth look at it over the course of this review. An indoor and outdoor foosball table will allow you to position it outdoors in the summer so that you and your friends can spice up your cookouts. On the other hand, you can return it indoors when the months start to get colder so that it won't be exposed to the elements all winter long. 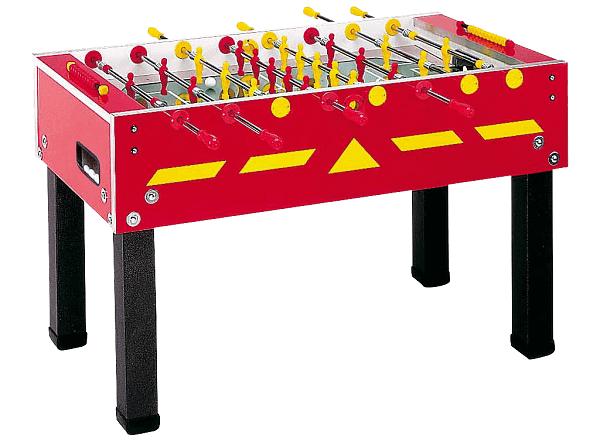 Before we move on to our review of this foosball table, we’re going to take a look at two aspects that you should always consider when buying your new foosball table. If you are already an experienced buyer and you know what you want out of your next model, feel free to head right down to our review. Of course, you’ll always want to account for the size of your foosball table, as it will make it easier to determine where it will fit in your home. Nobody wants to spend weeks waiting for a foosball table delivery only to discover that it doesn’t even fit in their home when fully assembled. With an outdoor foosball table, size is less of a concern and more of a matter of preference, but remember that we are reviewing a hybrid model which may also end up indoors. The size of your table will also determine what kind of experience you have, with smaller tables sacrificing gameplay for convenience and a lower price. The foosmen that come included with your table are the little players that you strike the ball with. There are a few different kinds of foosmen that can come with a new table, with some even being made of different materials, though the vast majority are made out of lightweight plastic. Weighted foosmen are largely seen as the best ones, as they will not rotate unless you push the rod, remaining in position since their center of gravity is more balanced. Having weighted foosmen makes it easier for you to set up intricate shots as you won’t need to rotate them into position as soon as you grab the handle. The Garlando G-500 is one of the best hybrid foosball tables that you will come across because it was designed for performance. While many other hybrid tables are designed solely to resist the elements and not provide an enjoyable playing experience, this foosball table provides you with both. While the G-500 may be one of the pricier tables on the market, it is worth the price, especially if you find yourself playing outdoors relatively often. While other hybrid tables are designed to be light so they can be taken indoors at a moment’s notice, this one is heavy-duty, relying on sheer water resistance. Made out of marine plywood and coated with several waterproofing agents, this table is ready for anything up to torrential rain. Even the metal hardware on this table is coated in an anti-rust polish that protects it from the elements, so you won’t have to worry about any possible water damage. Beyond the waterproofing, this table is also an excellent option for those looking for smooth gameplay. As long as you keep the chromium-plated rods polished, then the foosmen will rotate as smoothly as on any professional table, which came as a bit of a surprise to us. We also went over what others had to say about this product, and most reviewers were impressed with the G-500. When it comes to positives, the massive extent of the waterproofing was praised for making it easier to play outdoors with some peace of mind. 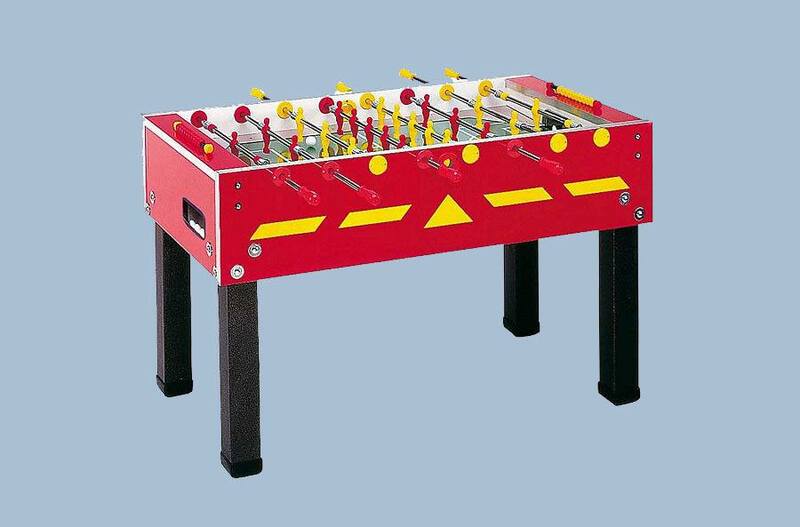 The durable design of this foosball table was also the subject of praise, as it is built to last, especially when compared to cheaper tables. Of course, there were also some negatives, as with any other product. Primarily, customers criticized the price point as being too high for the performance of the table. Another issue was that the foosmen are permanently molded into the rods, meaning that the entire rod will need to be replaced if one breaks. You are probably also interested in the price of this foosball table, and we have to admit that it’s rather expensive, but we would argue that it’s worth the price. You can expect to pay around 1100 dollars for one of these tables, and you can find them available online from Amazon or other retailers. The Garlando G-500 is an excellent choice for any customer that wants to play both indoors and outdoors without worrying about the integrity of the table. Thank you for taking the time to read through this review.